← Helen takes the holy dip at the Kumbh Mela! 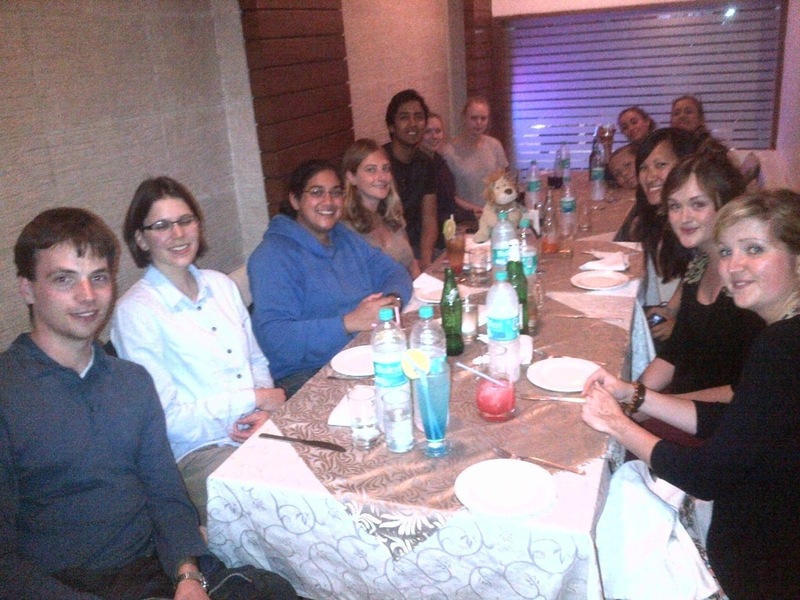 So Lewis the Lion’s ‘Essential India’ trip had come to an end with the G-Adventures gang and what an incredible time he’d had! 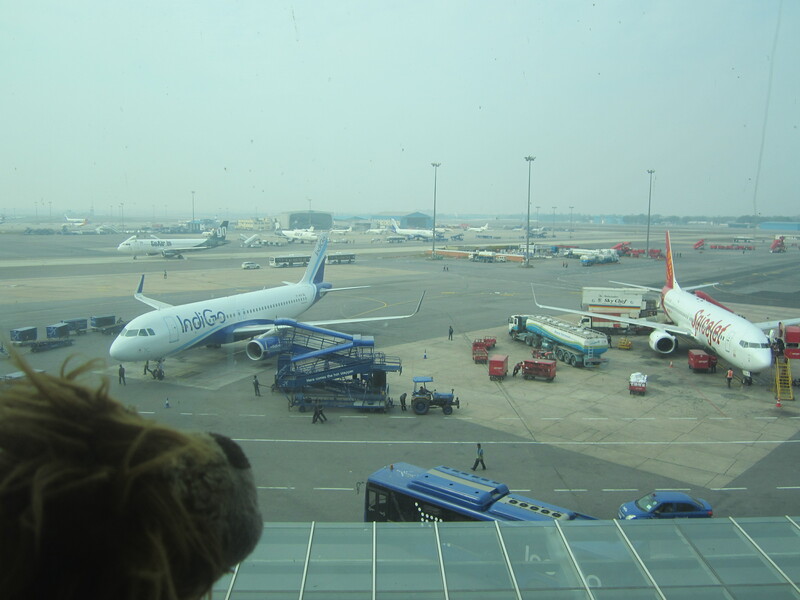 He couldn’t believe that he still had another week to go before he returned home to the UK but for now, he was catching a flight back from Varanasi to Dehli together with his new friends. He would enjoy one final last meal with them in the same restaurant they had started off at and what a delightful meal it was! 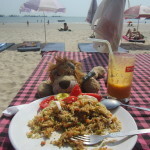 The next morning, Lewis the Lion and Helen got set again to catch another flight, only this time it was to travel to West India, to Goa. Although he wouldn’t be staying in Goa itself but rather travelling an hour away to a beach resort called Palolem. 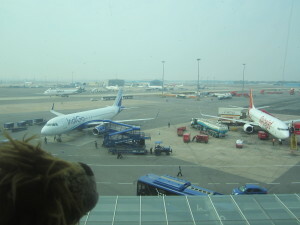 As Lewis the Lion’s plane started to descend, Lewis was surprised at how green the area was and he reminisced about his trip to Australia, as at certain points the ground below the plane looked rather russet in colour. However, the plane then swooped along near the coast where Lewis saw a sweep of golden sand that seemed to stretch on in a horseshoe shape for miles. ‘Ooh!’ Lewis the Lion had a wave of excitement. He was looking forward to just chilling out over his last few days of his world adventure and a few beach days would suit him down to the ground! 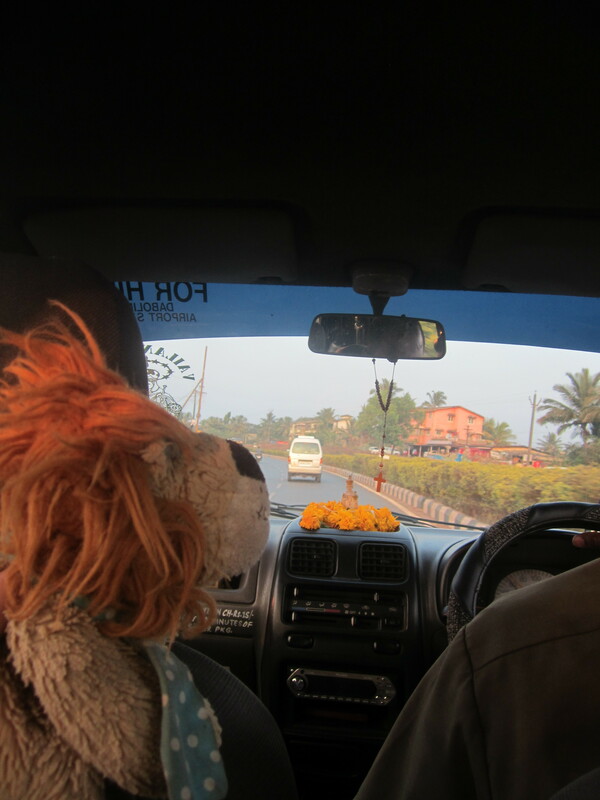 The number of people in India still amazed Lewis the Lion even though he’d been there for a few weeks now. Yet again he was incredulous when he saw how many people passed through Indian aiports: more than the population of Sweden in Goa! 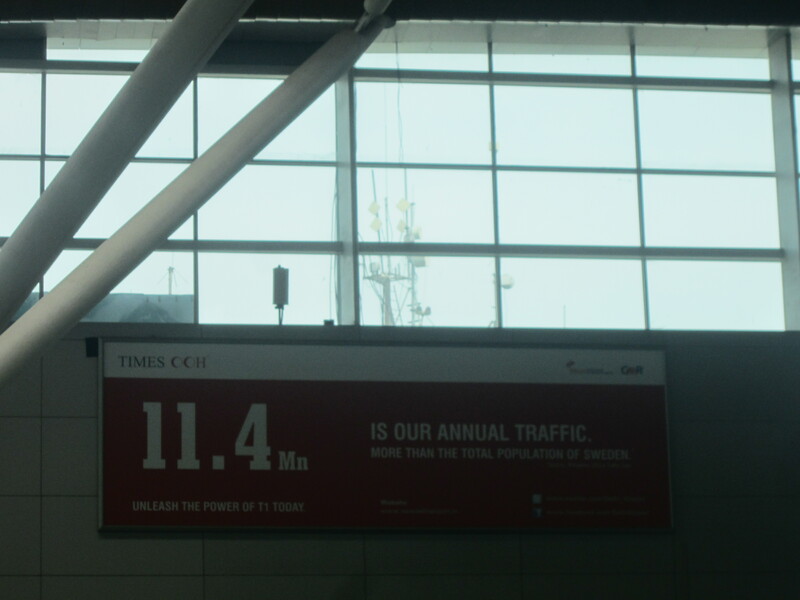 A huge volume of airport traffic! 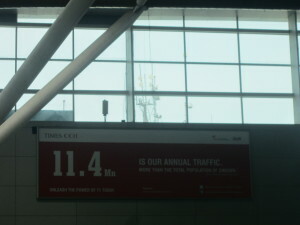 * The temperature was warmer than the north of India for although it was 6 o’clock in the evening, it was still 31 degrees. 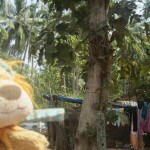 Palm trees stood tall in the fields and Lewis knew he had arrived in a tropical climate. * Elegant saried ladies poised beautifully on the back of motorbikes. * Brightly coloured houses matched the pink and coral-coloured flowers by the roadside. * This region seeed to have more Christians and even the taxi driver had a figurine of the Infant Christ on his dashboard. * Traffic seemed marginally less crazy, although cows and bulls still lingered on by the road fringes. 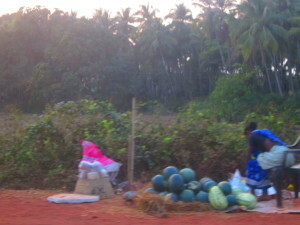 * Watermelons and coconuts being sold by the busy roadside, every few metres. Lewis the Lion discovered it was because it was the watermelon season. Being on the tropical West Coast of India, delicious exotic fruit juices abounded and it reminded Lewis the Lion of his adventure in Equador. 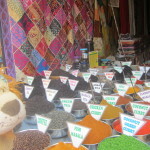 * Top of the menu in this part of the world was Goan Fish Curry – Lewis the Lion’s mouth watered at the thought of this spicy delight! * Stray dogs just seemed to be everywhere and they seemed to join in chorus at about 10:30 pm at night. * Being in a warmer climate, bugs and insects seemed to be more prevalent and above Lewis the Lion’s bed was a huge mosquito net. Nonetheless, one cheeky mosquito managed to get in straight away! 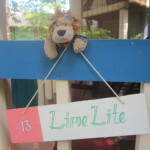 Over the next few days, Lewis the Lion had the most wonderful time, relaxing and writing his blog. 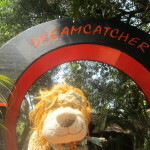 He was staying in a place called ‘Dreamcatcher’ which he felt was particularly apt considering the world adventure that he had had! Here people were very friendly and made him feel right at home. 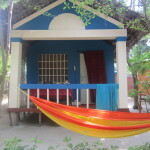 His hut was hidden along a sandy track beneath the trees, just a short distance from the beach. He simply loved it here! It was just a short walk up into the town and there were many great restaurants both at his resort and on the beach where he could watch the world go by. Lewis, as ever, felt like the luckiest lion that had ever existed. He felt truly at peace with himself and the world around him. However, he was about to discover something else that would help him to relax even more which he will tell you about in his next blog…! If you could choose any type of holiday to relax, what sort of holiday would it be and why? A beach holiday? A city break? An adventurous/sporty type of holiday? A skiing holiday? A countryside holiday? Or something else?